Edicts are renewable temporary modifiers with a fixed cost that an empire may choose to apply. Most edicts are unavailable at the beginning of the game and must be unlocked through research or events. All edicts have a base duration of 10 years. +10% Anomaly Discovery Chance This Edict pushes for further galactic exploration, to bring light to the darkness and find what wonders lie beyond. Capacity Overload 300 +20% Monthly Energy Credits Global Energy Management This Edict allows short-term overloading of energy grids, letting power plants across our empire run at increased capacity. Production Targets 300 +20% Monthly Minerals Colonial Centralization This Edict is a focused administrative effort to reprioritize and re-evaluate production goals, yielding a boost to mining output. Farming Subsidies 200 +20% Monthly Food Hydroponics This Edict provides aggressive economic stimulus for positive, quantifiable impacts on food production. Research Grants 200 +10% Research Speed Materialist This Edict favors our researchers with additional funds. Declare Saint 200 +15% Unity Spiritualist This Edict will bestow sainthood upon a deceased individual who led a particularly pious life, creating a new unifying symbol. Peace Festivals 200 +10% Happiness Pacifist This Pacifist Edict fosters a spirit of unity and good cheer through whole seasons filled with special events and festivals. Information Quarantine 200 +50% Governing Ethics Attraction Authoritarian This Edict puts strict checks on the flow of information, better preserving local cultural identities. Encourage Political Thought 200 +50% Ethics Shift Chance Egalitarian This Edict Encourages the populace to openly discuss political matters, even if the path taken may lead them astray. Pop Growth from Immigration Xenophile This Edict creates targeted PR campaigns that frame our empire as being on the cutting edge, a new social frontier - a place where anyone can thrive, a fresh start. Communications with at least one other empire This Edict initiates a diplomatic offensive in a concentrated effort to improve the image of our empire in the eyes of others. 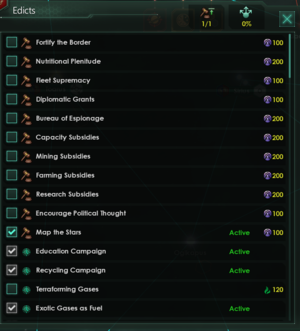 Advanced Resources Edicts cost an amount of advanced resources proportional to the Empire Size. Terraforming Gasses 25 +50% Terraforming Speed Terrestrial Sculpting tech By employing exotic gases to the terraforming process, we are able to achieve progress at a much faster rate. -25% Clear Blocker Time By using volatile motes for their explosive capabilities, we are able to clear difficult terrain at a much faster rate. Crystalline Sensors 25 +1 Ship Sensor Range By employing rare crystals to boost our sensors, we are able to gain a crystal clear picture of our surroundings. Exotic Gases as Fuel 50 +15% Sublight Speed Various exotic gases also function as excellent fuel for sublight travel, although perhaps not the most economical alternative. Exotic Gases for Shield Boost 50 +25% Shield Hit Points Some exotic gasses can be utilized for boosting ships' shield capabilities. They can create complex dampening fields to repel and soften enemy attacks. Focusing Crystals 50 +25% Energy Weapon Damage By increasing our ships' access to rare crystals, we are able to increase the damage of their energy weapons. Volatile Ammunition 50 +25% Kinetic Weapon Damage We are able to deploy volatile motes as an explosive in our ships' ammunition. Volatile Explosives 50 +25% Explosive Weapon Damage By using volatile motes to construct specialized missiles, our ships will have greater destructive capabilities. Volatile Reactive Armor 50 +25% Armor Hit Points By enhancing our ships' armor with a reactive component, our ships are able to absorb more damage by reducing incoming damage in a controlled counter-explosion. Living Metal Mega-Construction 50 +50% Megastructure Build Speed Living Metal tech The inherent properties of living metal makes it perfect for improving megastructure construction. Nanite Actuators 50 +10% Research Speed Simple but powerful nanoactuators, allowing for complex manipulations and experiments at mesoscopic scales. Campaigns cost energy or food and are unlocked by the Planetary Unification technology. Education Campaign 1000 +25% Leader Experience Gain Not Gestalt Consciousness Back to school! By momentarily spending resources to promote higher education programs among our leaders, their skills will improve at a faster rate. Recycling Campaign 1000 -10% Pop Consumer Goods Upkeep Not Gestalt Consciousness The populace must be taught to limit wasteful consumption of resources. A public awareness campaign to promote recycling will momentarily lower our consumer goods cost. Healthcare Campaign 1000 +10% Pop Growth Speed Not Gestalt Consciousness Diet, regular exercise and sleeping patterns all combine to affect the health of our population. By promoting a healthier lifestyle, their life expectancy will go up. Communications with at least one other empire The vile and beastly nature of the xeno must be communicated to our people. They must accept the truth that we stand alone in a sea of alien filth. Drone Campaign 1000 +10% Pop Assembly Speed Machine Intelligence By allocating additional resources to our production facilities, we are able to produce new worker drones at an even quicker pace. Machine Learning Campaign 1000 +25% Leader Experience Gain Machine Intelligence By allocating additional resources to our autonomous drones, they are able to increase the rate at which their self-learning algorithms improve their overall productivity. Drone Campaign 500 +10% Pop Growth Speed Hive Mind By allocating additional biomass to our spawning pools, we are able to produce new worker drones at an even quicker pace. Learning Campaign 500 +25% Leader Experience Gain Hive Mind By providing our autonomous drones with additional nutrients, we are able to increase their productivity. War Drone Campaign 500 +15% Army Damage Hive Mind By allocating our war drones additional nutrients, we are able to increase their strength and combat readiness. Ambitions become available with the Ascension Theory technology and are the most powerful available edicts. They cost base Unity equal to the next tradition to activate, but do not further increase tradition costs. They are the only use for Unity after all traditions are adopted. A brief yet highly productive golden age of scientific discovery. The combination of fearlessness, ingenuity and unbridled optimism can take you far. The cornered animal is indeed the most dangerous, as our enemies will soon find out. No effort must be spared to ensure our continued survival. Our frontiers shall be an unassailable line, and they will convey a clear message to our most ambitious neighbors - this far, no further! It is construction on a scale that previous generations could only dream of. Megastructures may well become the true legacy of our civilization. A concentrated propaganda effort to make the populace understand the merits of the government's position. Ultimately, it is for their own good. Everything that can be spared will be recycled and used. Our ambitions require all the resources we can possibly find. Our galactic ambitions require that the construction of A Grand Fleet must be our primary goal. As power is simply the ability to impose one's will on others, the will to power is a self-fulfilling prophecy. Event edicts work like empire edicts but are made available only by the completion of certain event chains. Resolved Abandoned Sensor Array anomaly by trying to activate it for the first time After having researched advanced sensor technology we have enough information to pour extra resources into enhancing our own search scans. Our technicians would have an easier time finding objects of interest at the edge of our systems with this initiative. Resolved The Fumes Lie Thick anomaly by not activating robots for the first time We can further limit the use of toxic fuels and non-renewable resources in order to promote research into new methods of energy production. This could help us come closer to a perfect energy cycle and improve the environment for our people to enjoy. Resolved Echoes from the Deep anomaly by caring about researchers well-being for the first time Spending time and resources to improve the working conditions of our people will surely result in better results and happier workers. Resolved Teachings of Traders anomaly with research Translations of an alien philosopher's teachings. Her anecdotes from diplomatic negotiations could act as a good base for diplomatic negotiations. Resolved Teachings of Explorers anomaly with research Translations of an alien philosopher's teachings. It contains several analysis and ponderings on the meaning of life and the purpose of the cosmos. By having our rulers follow these advice we can make more informed decisions. Resolved Teachings of Settlers anomaly with research Translations of an alien philosopher's teachings. By following her advice on how to unify the people via self-sacrifice we could make great strides in infrastructure. Resolved Teachings of Warriors anomaly with research Translations of an alien philosopher's teachings. Her depictions of war and ideas on combat strategy could make for excellent training material for our military. Bought the edict from the Numistic Order Caravaneer fleet The active use of Numistic visualization techniques will refocus our people's attention from personal gain to cosmic energy production. To achieve something, you must first visualize it.